Brought to you by KJ Gamez: Win 101+ free gifts with each game played to completion! Enter KJ super hero’s dreams, where all wishes come true. Find candy everywhere! But like too much of any good thing, sweets come at the price of black holes. They spurn monster and aliens, which must be placed in large pink bubbles. Fears are only real if you allow them to be. Enter over twenty dream sequences consisting of galaxies, forest art galleries, instant camera movie drive-in theatres, the news, ballet dance stages, painted shark pools, and paintings. Play the game to the end and receive several Koala Jo prizes! Tilt your device to navigate KJ across each screen. Tap your finger on the screen to collect candies and black-hole aliens. Tap quantum atom animation to proceed to another dream sequence. Tap the pause button to place the game on hold. Several menus allow access to game information, sound settings, scores, unlocked scenes, gifts, and other games. • Earn free, real-life gifts when playing the game to the the end! 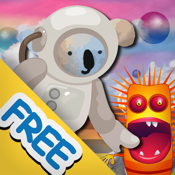 • Enjoy the lovable Koala Jo hero amongst awesome game graphics! • Experience the power of perseverance and delayed gratification! • Play with ease! This game was designed for any age (6 and up)!